The U.S. M4 Sherman Tank, formally known as the Medium Tank M4 was the main tank used by the U.S. and some of its allies during the Second World War. Despite being inferior to the heavier German tanks it was a reliable and capable tank and would play a part in winning the war. Other than by the U.S. forces the M4 was also used by British Commonwealth countries and the Soviet Union through the lend-lease agreement. The U.S. M4 Sherman Tank was the second tank by production volume to be used in WWII, the most produced being the Soviet T-34. During development the M4 wasn't a brand new design, it was an evolutionary design with it's roots in the Grand and Lee medium tanks. From them the M4 inherited a lot of the mechanical design but an important addition had been made - a 75mm main gun. The M4 was the first tank to have a gun on a fully traversing turret, it was also equipped with a gyro to act as a stabilizer. Thanks to these additions the M4s main gun could be fired, fairly accurately, while the tank was moving. Another important design feature of the U.S. M4 Sherman Tank was that it was designed with reliability and ease of production and maintenance in mind. The U.S. army wanted a tank that would perform as a workhorse in the field so that it could endure. Thanks to these features the M4 was superior to the German tanks of early WWII, at least in some regards. The M4 performed very well in the field and by 1942 would be one of the most important weapons in the offensives of the U.S. and its Allies. The M4 Sherman tank went through numerous upgrades throughout the war. The mainstay of the American tank battalions from 1944 onward, the M4A3 featured a Ford V-8 engine that provided excellent reliability and fuel economy considering the type. The majority of the A3s featured wet storage ammo bins, where the walls of the ammo bins were lined with water jackets to retard ammunition fires if the vehicle was hit. These fires had been judged to be primary causes for many Sherman tank losses throughout the war. 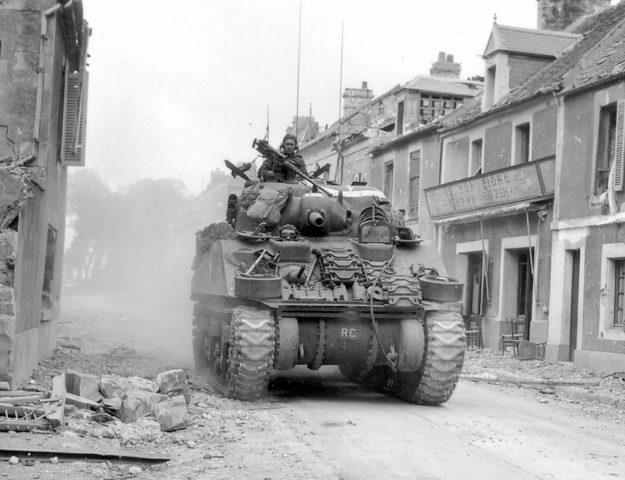 The M4A3 was the preferred US medium tank in Europe. It was a more compact power plant than the earlier model Shermans powered by radial aircraft engines. Since most of the vehicles in the armys inventory were powered by gasoline, it simplified supply over the diesel engined A2s, most of which were provided lend lease to our allies. The A3 model served as the basis for the definitive up-gunned variant with wider tracks and an improved suspension, the M4A3E8(76). M4A4 Model – Chrysler A57 Multibank 30 cylinder 21-litre engine. 470 hp at 2,700 rpm. front armor flat against both crew hatches compared to others that protruded above sloping armor." width="300" height="220" /> M4A3E8 participating in a World War II victory parade has front armor flat against both crew hatches compared to others that protruded above sloping armor. the Panzer IV. Because the U.S. M4 Sherman Tank could go toe to toe with the Panzer IV the U.S. Army decided not work on further tank development as they were sure that the war could be won with the M4. Another reason for not developing a stronger and more capable tank was that such a tank would automatically get heavier and bigger and this was often a problem in the field because of narrow roads and bridges. A few years into WWII other vehicles, using the M4 as a base, were developed such as the tank destroyer - M36 "Jackson". They used the M4 as a base but were equipped with open-topped turrets and stronger high velocity guns. During the last years of the war however the M4s and the tank destroyers based on it were far outmatched by the new German tanks. The Panther, a 45 ton tank, was much more powerful than the M4 and the tank destroyers. Each subsequent German tank was even more powerful and advanced than the M4, so it wasn't even a match for the Tiger I and Tiger II tanks, 56 and 70 tons respectively. Many M4s were destroyed by the Tigers, mainly due to the fact that the heavy armor of the Tigers could withstand the M4 gunfire and the powerful gun of the Tiger could easily destroy the M4s. The Tigers came too late to save the Germans. Their tank was better and more powerful than the M4 but in the end the M4 won in the numbers game. The Western Allies had a lot more M4s than the Germans had Tigers and the Allies also made use of their improving fighter-bombers and artillery to improve the M4s odds in the battlefield. The main advantage of the M4 remained that it could be easily made and repaired. The Allies also made an effort to recover and repair the M4s instead of just abandoning them. Thanks to the repair efforts a lot of the M4s that were recovered returned to the battlefields. Thanks to these factors the U.S. forces usually had more tanks in the battles, they had so many tanks that many infantry divisions also had a U.S. M4 Sherman Tank battalion or a tank destroyer battalion and sometimes they even had both. During the last year of the war German panzer divisions were often crippled, most of them not being at full strength. There were alternatives to the M4. 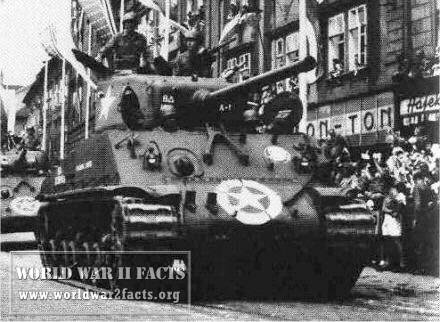 There was the M26 but because the M4 was favored by the commander of the Ground Forces the M26 entered the war too late and didn't contribute much to the war effort. In the Pacific battlefields the M4 was mainly used against Japanese infantry and strongholds. The much lighter and less powerful Japanese tanks were no match for the M4, so much so that the M4s superiority against the Japanese tanks was overwhelming. Almost 5,000 of the U.S. M4 Sherman Tanks were produced and it was also the base for other vehicles such as tank destroyers and tank retrievers. 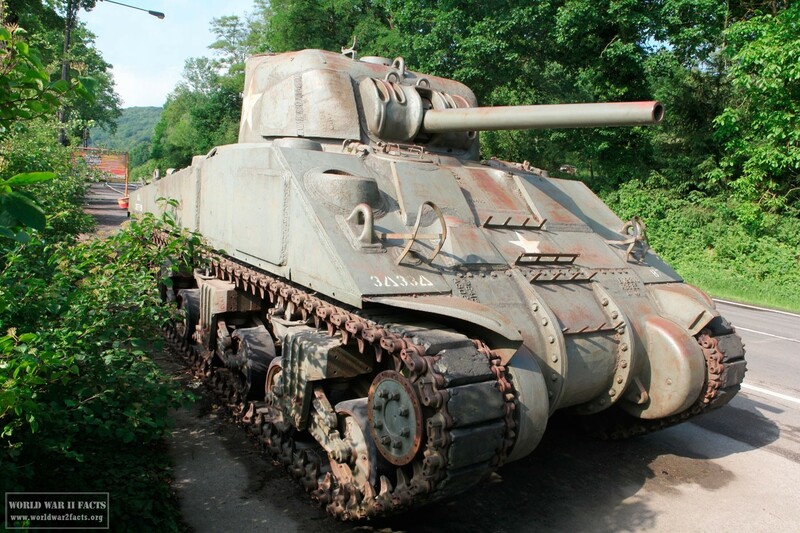 M4 Sherman Tank, WWIIVehicles.com, Last Viewed: 17 January 2014. Sherman Tank, Israeli-Weapons.com, Last Viewed: 17 January 2014. 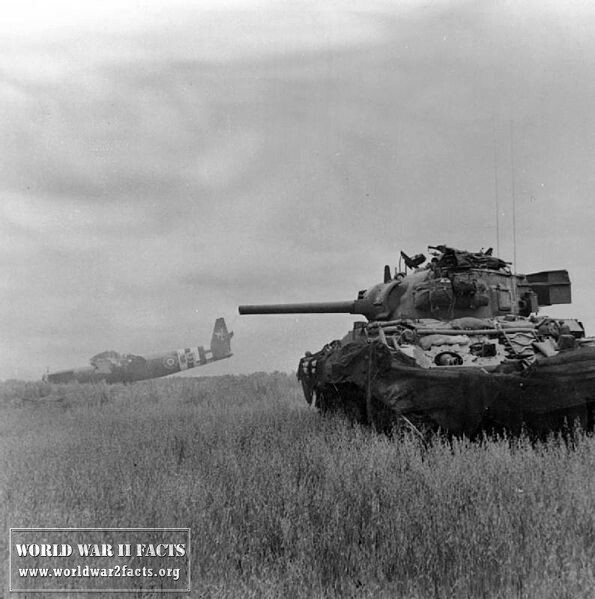 WW2 Tanks, OnWar.com, last Viewed: 17 January 2014.